We travel Route 5 frequently, about 12 times a year at least. I’m always seeing those nifty State Historical Markers as we drive by, but traffic has always been too heavy or I’ve always been running too late for us to stop and read them. Our latest trip was much more leisurely, so we took some time to stop and snap a few photos. New York State is so rich in history, and that richness so varied! Now, I didn’t stop to get EVERY historical marker along the way, just the ones I could safely stop and photograph. 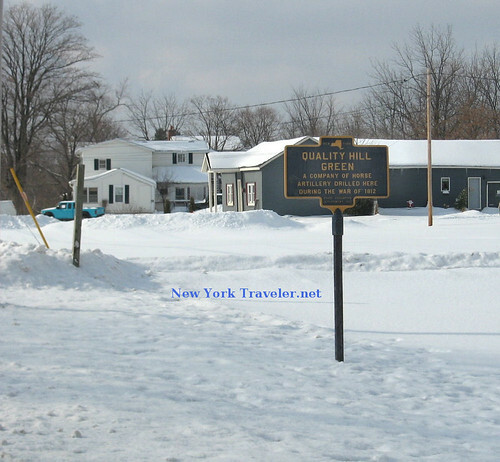 If you have a hankering for all the State’s historical markers, I suggest you go to the NYS Museum Historic Markers Site (link in the sidebar). They have a listing of markers, by county. 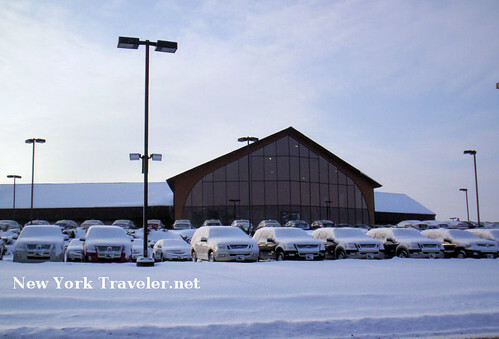 We left Oneida, NY, to see one of our personal favorite landmarks– the First Church of Toyota. It’s a car lot. But the building is so stylish and fancy and so cathedral-like that we joke amongst ourselves and call it the First Church of Toyota. Ha! This marker is right outside the limits of Chittenango (the birthplace of Frank L. Baum of Wizard the Oz fame). It’s an odd one. Canaseraga. Site of first settlement in the Town of Sullivan. March of 1790. Bicentennial-June 30, 1930. This may have been the location of a Fort Canaseraga, but the location is disputed. 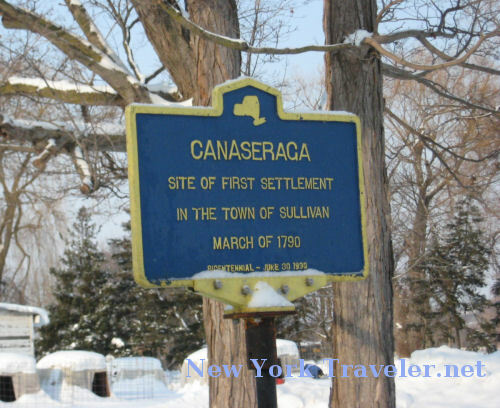 One historian/archaeologist believes this marker is misplaced, as this area was a Tuscaroran settlement, and not a Canaseraga squatters’ settlement at the time of 1790. The marker remains, true or not. Weird. 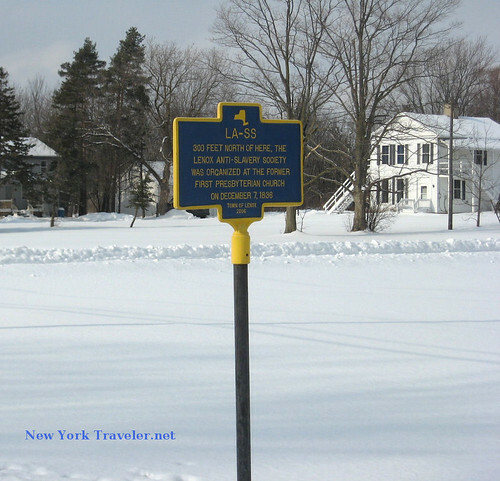 Outside of Canastota is this remarkable little marker. Apparently, Amelia Earhart visited the area in 1928 to dedicate a municipal airport here. Like so many businesses in Upstate NY, this airport closed. It has now become a business park. The view is beautiful from the hill up this road. Amelia Earheart. 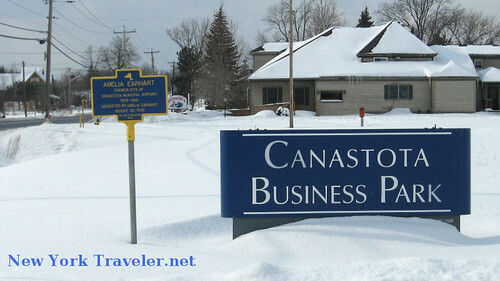 Former site of Canastota Municipal Airport 1928-1989. Dedicated by Amelia Earhart. August 28, 1928. Village of Canastota 200[?]. Not far from the previous marker, another one pops up, marking the spot of an 1836 Anti-Slavery Society in the town of Lenox. Dozens of anti-slavery societies in Upstate New York after Charles G. Finney’s incredible religious revivals that swept the state from east to west in the early 1800s. His teachings taught that men were equal under God and under the law, and spurred the Underground Railroad across the state. LA-SS. 300 feet north of here, the Lenox Anti-Slavery Society was organized at the former First Presbyterian Church on December 7, 1836. Town of Lenox 2006. Right behind this marker is another. A company of horse artillery drilled here during the war of 1812. We went as far west as Fayetteville. I’ll have more about this beautiful little town in the next post. I really enjoyed this post. My wife and I used to live in Connecticut and would frequently make trips to visit family in our native state of Michigan. 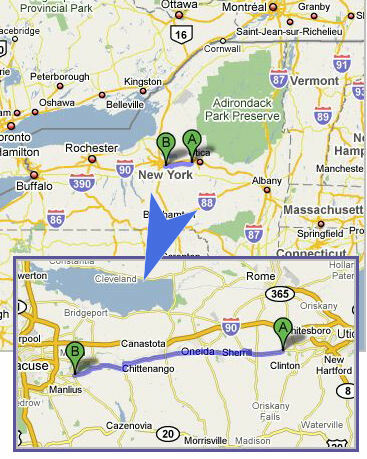 It became a usual stop on our return leg to stop at Canastota to spend the night. I remember seeing [at least some of] those historic markers. My family tarried in New York state as they made their way west to Michigan. Ditto for my wife’s ancestors.